America's Jordan Spieth hit a final-round 69 to win the Tour Championship in Atlanta, earning £7.5m by also securing victory in the FedEx Cup. The 22-year-old finished on nine under to claim a cheque for £977,000 to add to his £6.5m bonus for winning the end-of-season play-off championship. Spieth has earned more than £14m this season and is the new world number one. He beat New Zealand's Danny Lee, England's Justin Rose and Swede Henrik Stenson by four shots at East Lake. Englishman Paul Casey was among those a shot further back on four under. Northern Ireland's Rory McIlroy finished on one over after a final-round 74, while Australia's Jason Day ended tied 10th on two under. "This is one I cannot wait to celebrate," Spieth said. "This is incredible." The US Masters and US Open champion took a one-shot lead over Stenson into Sunday's final round and had doubled his advantage by the turn, despite dropping shots on the fifth and sixth holes. His formidable putting saw him hole out from 20 feet on the eighth, 18 feet on the par-five ninth, and from 45 feet on the 11th. Stenson, who held a three-shot lead after 36 holes, bogeyed the 12th to ease the pressure on Spieth, with the Swede carding a final-round 72, which included a double-bogey six on 17. 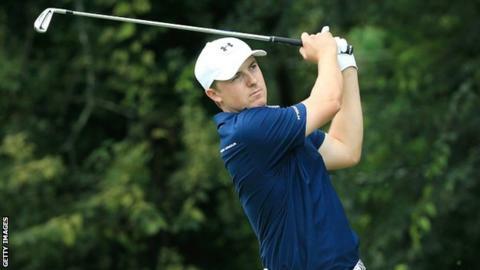 Spieth added: "This is an event we approached like a major championship. I didn't have a great play-off, but I put a lot into this week. Mentally, I stayed in it. And boy, that putter sure paid off."